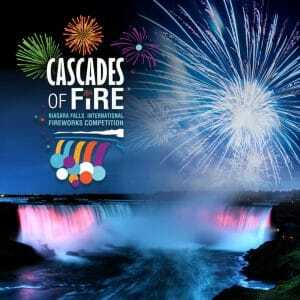 Cascades of Fire International Fireworks Competition in Niagara Falls. This November, countries from all over the world will head to Niagara Falls to compete in the Cascades of Fire International Fireworks Competition as part of Niagara’s annual Winter Festival of Lights celebration. The competition will feature 18-minute pyrotechnic shows presented by each country and spectacularly light up the skies over Niagara Falls. Each show starts at 9pm and can be enjoyed from Queen Victoria Park, along the Niagara Parkway, or from a Fallsview room at a spectacular Niagara Falls hotel. And don’t forget to check out all of the other amazing events and lighting displays that are a part of this year’s Niagara Falls Winter Festival of Lights, which kicks off on November 3, 2018!